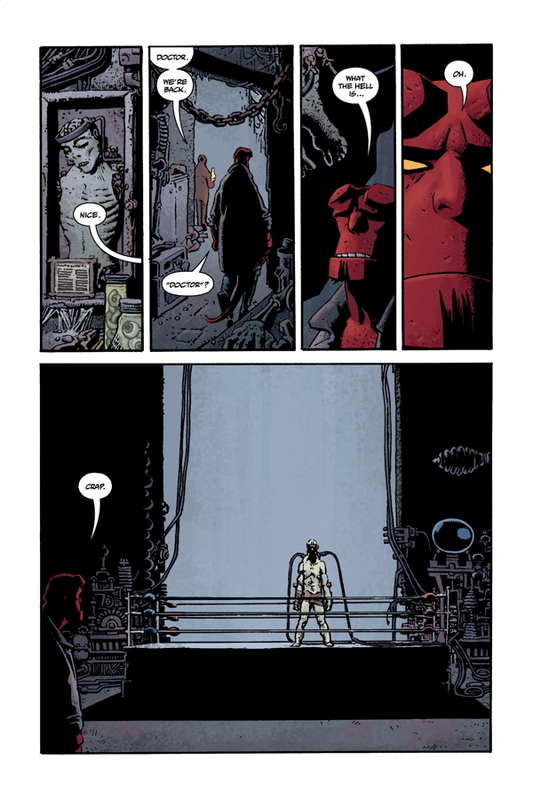 One of the big reasons I never tire of Hellboy and the universe that he occupies is that the stories are so off the wall and full of stuff you'd never expect if you just took the character at face value. 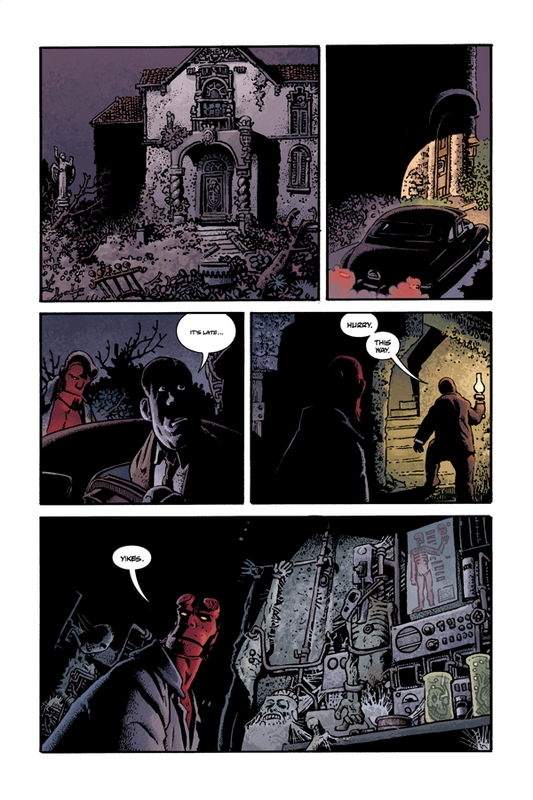 Take the brand new Hellboy: House of the Living Dead for example. This hardcover graphic novel has most of what you've come to expect from the big red dude, and then some. Set in 1956, the book picks up after Hellboy has been missing for about 5 months- lost in the backwater towns of Mexico. Seems the BPRD sent him down there to investigate a number of strange murders and, as a result, he ended up teaming with a bunch of luchadores (Masked wrestlers) and killing vampires... yes, you read that correctly. Anyway, things go bad- Red loses one of his buddies in a fight and starts to wallow in his own crapulence, wrestling away his time on the Mexican circuit. Events take another turn for the weird (this is Hellboy remember?) when a stranger proposes a fight at his employers castle to the big guy. Needless to say it goes downhill from there as monsters, damsels in distress, and headlocks abound. Story-wise, the book is terrific with loads of nods to the classic horror beasts of old. Now, if you're not really into those 'guys', House of the Living Dead may not blow you away. There are really no over the top, explosive moments that make a lasting impression. Fans of Hellboy, Dracula, and Frankenstein (and others) though will be instantly at home. With this many iconic monsters, you might think there wouldn't be enough room for them all but nothing feels forced. In fact, as the plot rolls out and more and more oddities are revealed- I think you'll find that they all fit very nicely together into the tale that writer (and Hellboy creator) Mike Mignola has crafted. In fact, the book itself is Mignola's tribute to those monster movies and stories of old. As such, it's a fitting one. Mignola also supplied the pencils for the cover, but that's where his artistic duties end for this one shot. The actual work for the book was provided by Richard Corben, who shines here. His dark and foreboding panels ooze with an amazing amount of detail and his character work strides the line between cartoony and realistic- great pulpy stuff. 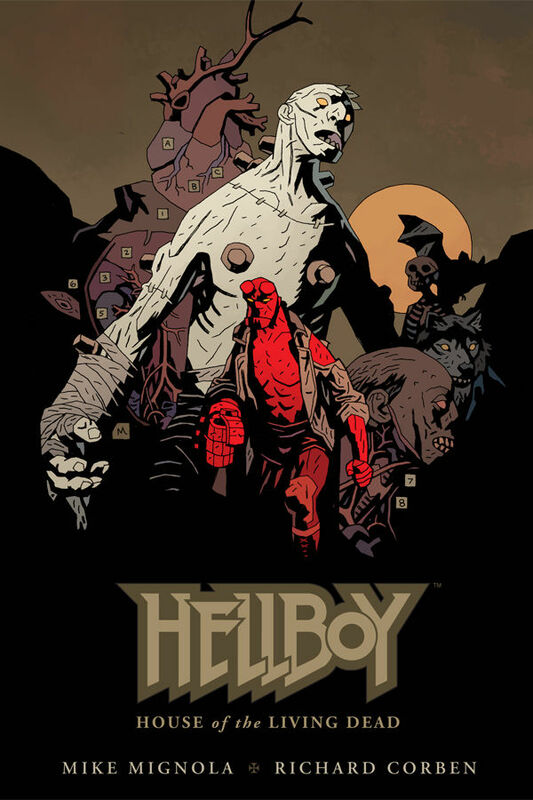 Although I'm not the biggest fan of classic monster movies, I am a fan of Hellboy, so perhaps I'm a bit biased and needless to say at this point, I really enjoyed this book. All the aspects are there and Hellboy is just a plain old fun character. Although you won't find the rest of the BPRD anywhere in here (this is Red flying solo) there's still a lot to like for anyone who enjoys a solid two-fisted suplex tale set in the Hellboy universe.